Eyes turn to Singapore this week as President Donald Trump and North Korean leader Kim Jong Un prepare to meet for the first time. 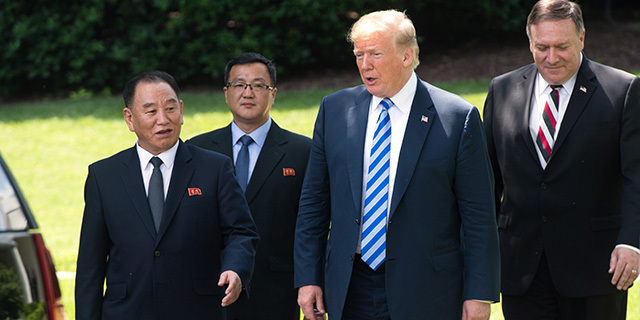 While previous communication between the two leaders was marked by hostility, the meeting came about following North Korea’s more recent promises to suspend missile tests and discuss denuclearization. 1 Americans overwhelmingly say they support direct talks between the United States and North Korea over its nuclear program. About seven-in-ten (71%) approved of such talks, while just 21% disapproved, according to a Pew Research Center survey conducted in late April and early May. While majorities from both parties approved of negotiating directly with North Korea, Republicans and Republican-leaning independents were particularly likely to approve (85%) compared with Democrats and Democratic leaners (63%). Despite the overall approval of direct talks between the two countries, the public was skeptical about whether North Korea’s leadership is serious about addressing concerns about its nuclear program. 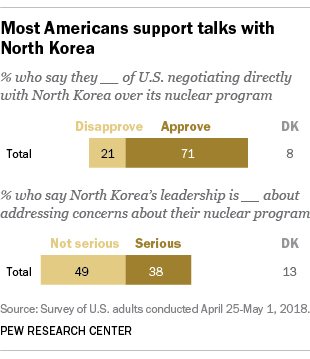 Around half of U.S. adults (49%) said North Korean leaders are not serious about addressing these concerns, while 38% thought North Korea’s leaders are serious. 2Three-quarters of Americans (75%) saw North Korea’s nuclear program as a major threat in a survey conducted in October. This share is as high as at any point since 2005. 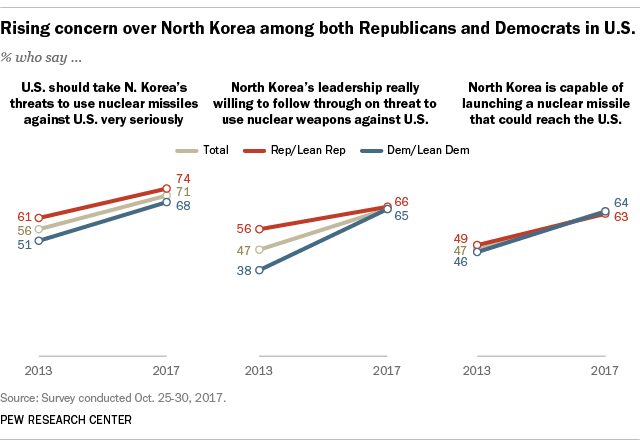 Around seven-in-ten Americans (71%) said the U.S. should take North Korea’s nuclear threats “very seriously.” Majorities also said North Korea is capable of launching a nuclear missile that could reach the U.S. (64%) and believed that the country’s leadership is really willing to follow through on threats to use nuclear weapons against the U.S. (65%). Concerns have grown among Republicans and Democrats alike on these questions since 2013. 3People in Asia-Pacific countries were also concerned about North Korea’s nuclear program. While majorities in the region were at least somewhat concerned, some of Pyongyang’s closest neighbors were most worried, according to the Center’s spring 2017 Global Attitudes Survey. Around 60% or more in Japan, the Philippines and South Korea said they were very concerned about North Korea having nuclear weapons. People in Vietnam were the least worried – only around a quarter (23%) said they were very concerned. 5Japanese and South Koreans expected the U.S. to come to their aid in the event of a serious military conflict with North Korea – and Americans supported defending their allies. (Japan and South Korea are U.S. treaty allies, meaning that if North Korea were to use military force against them, the U.S. would be obligated to defend them.) Large majorities in South Korea (91%) and Japan (82%) expected the U.S. to defend their country if such a conflict were to happen, the spring 2017 survey found. Nearly two-thirds of Americans (64%) said the U.S. should use military force to defend its allies in Asia if they got into a serious military conflict with North Korea. A more recent survey by the Asan Institute found that when South Koreans were asked what country should take the most active role in solving North Korea’s nuclear-related problems, South Korea (45%) and the U.S. (31%) were the top choices. 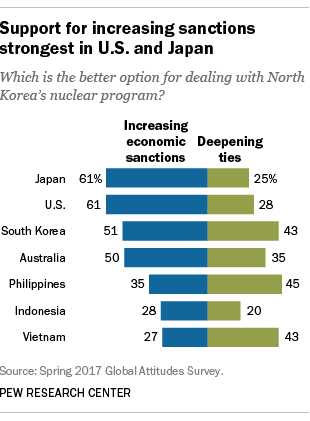 Yet when asked what country will take an active role in solving North Korea’s nuclear issues, a plurality of South Koreans pointed to the U.S. (51%) over their own country (27%).